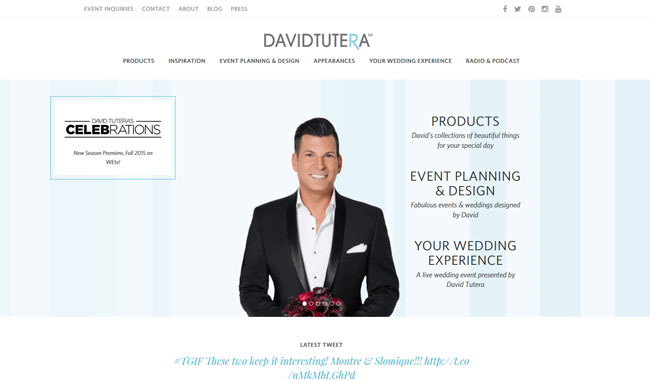 A common question we get is do you need a website for your business? What type of pages do you need on your site? How do you even make a website? I will compile all the resources you need to make your site in this post. A website absolutely helps you get more clients, and I know what you’re thinking. I recommend you don’t spend any money on your site when you are starting out. Fortunately, with the creation of WordPress anyone can now make their own sites for free. There are also free site builders like Wix.com and Weebly. However with Wix and Weebly you cannot use your own domain name so I recommend you use WordPress so your domain is the same as your business name. It’s much more professional this way. When you first start you should have a Home page, About page, Services page and Contact page. The most viewed pages you will have will be your Home page and your About page so be sure to spend some time on those. Your home page should have your company name, a few sentences about what you specialize in and professional photos of events you have participated in. 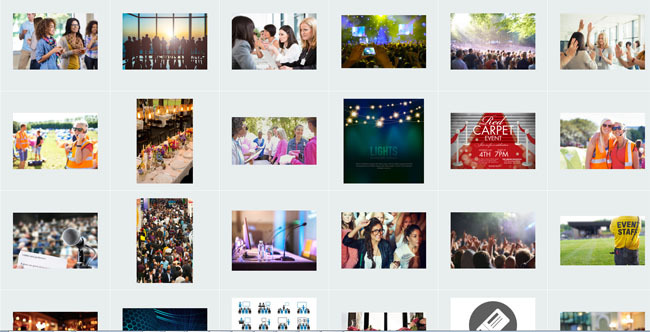 If you do not yet have photos of your own, you can use very nice stock images like these. A big mistake people make is they do not include a personal story on their “About” page. Your potential customers want to connect with YOU and your story. Have you heard the saying “People do business with those they like”? This is so true and when you present your personal story, customers start feeling like they know you and are building a relationship with you. So you absolutely want to include your personal story. 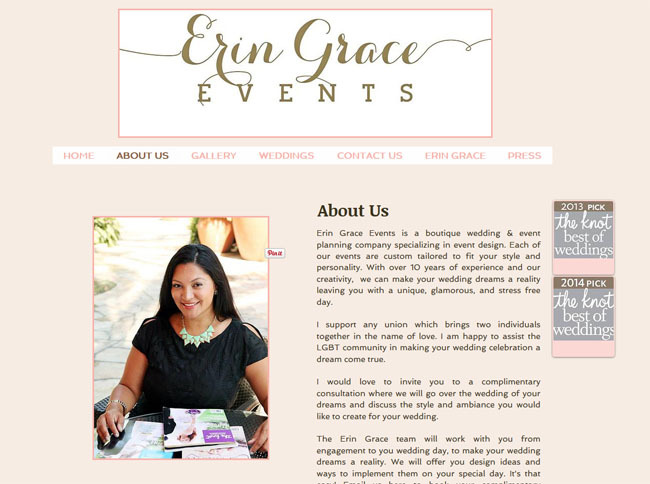 How did you decide to get into event planning? Also be sure to include a photo of yourself or your team. This is especially true for those who plan weddings – brides want to connect with you. If you want to take things to the next level you can get professional photos taken. You can include a little about your experience as well. Even if you do not yet have a lot of experience, be sure to include information about any events you participated in even if they were for friends or family; any volunteer work or charity events; any organizing for your kids or their school; and even any community organizing that you did around your neighborhood. 1. Decide on the domain name you want for your site. It will most likely be the name of your business. You can buy the domain at GoDaddy or Namecheap. Personally I like Namecheap but a lot of people use GoDaddy too. They are basically the same service and the domain name will cost you about $9. 2. Next you need hosting. I really like Bluehost because of how inexpensive they are. You will not find a better reliable host for a lower price and they have a special going for $3.95/mo right now. After you sign up with Bluehost, I really like that they have a 1-click installation of your site! This means that your site can be live in about 5 – 10 minutes from the moment you sign up. At this point your site is 100% live for you to start writing and filling in your Home page, About pages, etc. After you write out some of your content you can change the look of your site by browsing the hundreds of very nice, free WordPress themes available to you. There are tons of free wordpress themes you can use after you get your hosting set up. You can check out this site for 50+ free themes. If you don’t see ones you like there you can Google for “free wordpress themes 2015”. I like to add 2015 to my search so the newest themes show up. 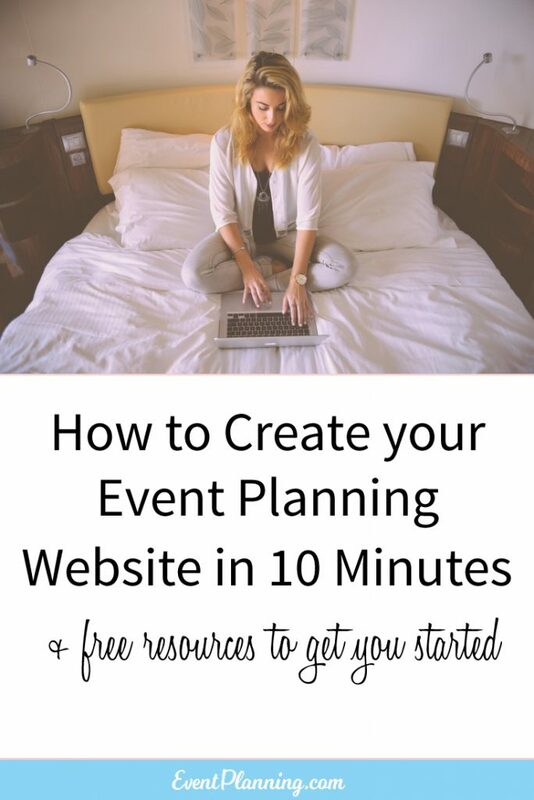 That covers it for a basic tutorial on creating your own event planner business site. If you already have a site or you create one from this tutorial be sure to post your URL in the comments so we can all check it out! My domain and website is with GoDaddy. I understand there is nearly zero SEO with this site. I purchased the least expensive package not understanding that I would get less SEO. People more knowledgeable than me say, “move it to WordPress.” The transferring of the domain is confusing to me. Will Bluehost help me with that? Thank you. Hey Darin, I completely agree that if you want SEO benefits to your site you should move it to WordPress, and Bluehost will help you move your domain to them. What you can do after you check out Bluehost (http://www.eventplanning.com/host-discount.php) is check out this site (http://smallbusiness.chron.com/move-godaddy-bluehost-34261.html) to know the general steps of moving the domain but overall Bluehost is very helpful. Thank you so much for this helpful information! I’m currently paying 40.00 for my website. I can’t wait to pay less and hopefully bring in more clientele.